LANSING, Mich. — It sounds like the start to a corny joke, "a lion walks into a dentist." But it is something that happened to a lion at Potter Park Zoo, only it was transported there by workers. Ulana the lion is doing well now, but that wasn't the case a month ago because she needed a root canal. Veterinarians say like humans, dental health is important to an animal's well being. "It really does improve the overall health of the animal by cleaning their teeth and keeps them as healthy as possible," Dr. Ronan Eustace said. But the task isn't easy. 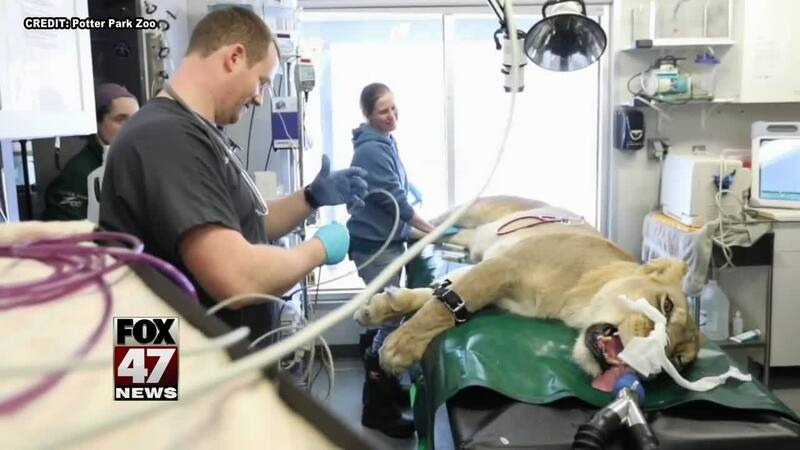 "With the lion, we often have to have something opening the mouth and then stick your arm in," Dr. Eustace explained, holding the tubes of the zoo's anesthesia machine. Eustace was just one of the veterinarians that assisted in the Ulana's root canal, which is something that isn't uncommon. "Sometimes their teeth can get a bit weaker and they can be more predisposed to being damaged and they like to chew on big bones, or sometimes they will break them on the big bones." When keepers noticed the damaged tooth, they knew something had to be done and it's not a simple trip to the dentist. It takes multiple veterinarians, some with specific dental skills. "Just the physicality...they weigh anywhere from 350, 400, some even weigh 500 pounds. So they're just big. It's hard to move them and they're dangerous so we have to be aware of the safety of the staff and the safety of the animal," Dr. Eustace said. Dr. Colleen Turner was called in to assist with the procedure, which is something she says she enjoys. "It's really cool. Working with larger animals, a lot of providers of supplies have come up with larger equipment for this purpose. Because say you are working on the K9 tooth on a lion, it could be six to eight inches long so that's an enormous tooth to have to clean the center canal out and file it," she said. Ulana the lion healthy now, and is back in her exhibit at the zoo. The zoo says people can come and visit anytime during open hours. Vets added that the recovery time for a procedure like this is relatively short. Ulana was back out the next day.